An exposé of the greatest secret on earth – the military and intelligence reports that prove UFOs exist. UFOs remain a key military and intelligence problem – one demanding unprecedented security and deception. Access to information is on a strictly ‘need to know’ basis. In 1960, former CIA director Admiral Hillenkoetter confirmed that, ‘Behind the scenes, highranking Air Force officers are soberly concerned about the UFOs. But through official secrecy and ridicule, many citizens are led to believe the unknown flying objects are nonsense.’ The same is still true today. Timothy Good, bestselling author and one of the world’s most respected authorities on alien phenomena, has drawn together years of in-depth worldwide research to put forward a case that is impossible to dismiss. Need to Know is a compelling exposé of top-secret documents, interviews with key witnesses and discussions with military and intelligence specialists, pilots, politicians and scientists. It is full of revelations, including the alarmingly high number of aircraft crashes following military attacks on UFOs; the disappearance of hundreds of military and civilian aircraft during UFO encounters; and the amazing information provided by a surgeon who operated on an alien captured by the Brazilian army in 1996. Complete with a foreword from Bill Gunston OBE, a fellow of the Royal Aeronautical Society and one of the world’s foremost aviation historians, Need to Know proves that UFOs are a real and current problem facing governments worldwide. The evidence presented is clear, balanced – and irrefutable. Need to Know is now published in an updated paperback edition by Pan, price £8.99, and by Pegasus Books, price $16.95. “U.F.O. Three letters that produce a creeping feeling of unease in normally rational people . . . In this country, members of the UFO community are rather like members of the Church of England: they love the feel of the subculture – the conspiracy theories, the films, the TV series, the video games, the merchandise – without subscribing to the implausible doctrines. They leave that to Americans, where UFO conventions are packed with believers in ‘grays’ (little grey aliens with wraparound eyes) and fabulously sophisticated spaceships. Even born-again Christians are in on the act, arguing that grays are a portent of the Antichrist. “Winston Churchill was accused of a cover-up of an encounter between an RAF aircraft in the Second World War because he feared a ‘panic’ and a loss of faith in religion, according to newly released secret files. “The Prime Minister allegedly banned reporting of the incident off the English coast for 50 years. He was said to have issued the order during a meeting with General Eisenhower, the US commander of Allied Forces, in America during the latter part of the war . . .
“The allegations involving Churchill were made by the grandson of one of his personal bodyguards, who wrote to the Ministry of Defence in 1999 . . . According to the papers, a reconnaissance aircraft was returning from a mission when it was overshadowed by a metallic UFO near the coast of England, possibly over Cumbria. Its crew photographed the object, which they said ‘hovered noiselessly’ near the aircraft. “The letter writer, a physicist from Leicester whose details are redacted in the documents, claimed that his grandfather, an RAF officer, overheard Churchill talking to Eisenhower about the incident . . . During the meeting, a weapons expert dismissed suggestions that the object was a missile because the event was ‘totally beyond any imagined capabilities of the time’. . .
“RAF fighters were scrambled 200 times a year to intercept unidentified targets on the radar of Britain’s air defence systems during the cold war right up until 1991, according to the latest batch of UFO files released by the National Archives today. This new book is a history of British UFO sightings, written by a leading Welsh investigator whose interest in the subject was sparked by her encounter in July 1955 with a flying saucer which suddenly appeared above a car she and two others were in and landed right in front of them, in Bexleyheath, Kent. Simultaneously – though she was not aware of it at the time – another similar craft landed nearby. There were over 100 witnesses. I’ve known Margaret since 1974. We’ve investigated a number of cases together and I can vouch for her honesty and dedication to the subject. “Link to the Stars” has my full recommendation. For a signed copy of “Link to the Stars”, please send a cheque or postal order to the value of £14, which includes postage & packing (UK only), made out to “WFIU Secretary”, and mail to:- WFIU, 5 The Broadway, Abergele, Conwy, Wales, LL22 7DD. For the last 19 months I have been writing a feature length film script in collaboration with Colonel Charles Halt (Ret) based on the events that occurred during the Christmas period 1980 at the United States Air Force twin base complex of RAF BENTWATERS and WOODBRIDGE where he served as the Deputy Base Commander. Our collaboration began in December 2007 after a chance meeting while working on a documentary programme about those events that have become collectively known as ‘the Rendlesham Forest incident’ and regarded by many as the most important UFO case since the Roswell incident in 1947. The resultant script contains the most accurate timeline yet produced and Colonel Halt fully endorses its content that is based on his personal involvement in the proceedings, the known events involving other witnesses and on his genuine belief that several of the military witnesses were the victims of psychological manipulation after their respective sightings. “I wish to make it perfectly clear that the UFOs I saw were structured machines moving under intelligent control and operating beyond the realm of anything I have ever seen before or since. I believe the objects that I saw at close quarter were extraterrestrial in origin and that the security services of both the United States and England were and have been complicit in trying to subvert the significance of what occurred at Rendlesham by use of well practiced methods of disinformation. So what's in the classified stash? Good’s reminder comes a few weeks after an international panel of high-level pilots and aviation experts presented dramatic evidence at a Washington press conference for the potentially dangerous aspects of UFOs. Event organizers at the Coalition for the Freedom of Information (http://www.freedomofinfo.org/national_press.htm) are trying to figure out which agency might best manage this sort of research project. The feds abandoned their official UFO study with the Air Force’s termination of Project Blue Book in 1969. But Good, whose latest book “Need to Know: UFOs, the Military, and Intelligence” reached the States in October, stresses that classified data collection never ended. Good is equally suspicious of the ostensibly transparent UFO reporting system in the United Kingdom. Although its Ministry of Defence cites “no evidence which substantiates the existence of these alleged phenomena,” Good’s book presents evidence to the contrary. Good, who was arrested by military police in 1985 for getting a little too nosey around the RAF’s Provost and Security Services headquarters in Wiltshire, applauds the Coalition’s ability to provoke decent coverage for its initiative last month. Because, unfortunately, that's largely up to the American MSM. Um, about those forthcoming MoD revelations touted this week in the London press — they're, um, a little stale. Veteran British UFO researcher Timothy Good points out that Sunday's story in The Observer — which breathlessly detailed a close encounter involving a Vulcan bomber in 1977 — actually came from documents released in 2005. You can find the same story in Good's most recent book, published last year, entitled "Need To Know: UFOs, The Military and Intelligence." Excerpts from the official Royal Air Force report are on page 306 in the U.S. edition. But four days ago, The Observer announced "Now, 30 years later, the extraordinary encounter is among thousands of previously secret cases contained in the government's 'X-Files' that officials are to release in their entirety." Furthermore, Good writes in an e-mail, "Have a look at pp. 431-2 and you'll see the MoD document on the extraordinary RAF Shawbury and RAF Cosford incidents in March 1993 - published for the first time in Need to Know. Yet it's constantly cited as one of the secret documents to be released by the MoD this year." This one involved a UFO that painted air traffic control radar screens, directed a beam of light groundward from an altitude of between 400 and 500 feet, and left some 70 eyewitnesses scratching their heads. "Frankly," wrote the perplexed Assistant Chief of the Air Staff, "I can see little that we can do to follow it up." Richard: First things first. Thank you very much for taking the time to answer these questions. I really appreciate it and I'm sure the BoA readers will too. Your very first book, co-written with Lou Zinsstag, was George Adamski The Untold Story. What most impressed you about Adamski and have your thoughts on him changed much since writing the book? Timothy Good: Adamski's photographs (and films) impressed me a great deal. Also, his initial encounter near Desert Center, California, in November 1952, was witnessed by six people who signed affidavits testifying to the fact. I knew two of those people, and they weren't lying. His famous photos, taken with a plate camera attached to a telescope, have been authenticated by a number of qualified people. As for his films, the last and best one - showing a craft similar to the one he photographed in 1952 - was taken at Silver Spring, Maryland, in February 1965, witnessed by my friend Madeleine Rodeffer and three US government employees. The 8mm colour film was authenticated by Bill Sherwood, an optical physicist and a senior project development engineer for the Eastman-Kodak company in Rochester, NY. In May 1998 I was invited to the Defense Airborne Reconnaissance Office in the Pentagon, which at that time handled the unmanned spy planes programme. The director, Major Kenneth Israel, implied to me that the film was genuine. Unfortunately, copies of the film (sometimes shown in documentaries) are unconvincing, being darker and more contrasty than the original film. Individual frames light-enhanced by Sherwood show much more detail. As for Adamski's claim that the aliens he met were from all the planets in the solar system - Venus and Mars in particular - this has understandably given rise to much ridicule. Most likely, this was a smoke screen to protect their actual origin. However, I don't discount the possibility that alien bases exist on the other planets in our system. Indeed, I think it quite likely that Venus and Mars, and several moons of Saturn and Jupiter, for example, qualify in this respect. Any adverse temperatures and pressures can be dealt with by means of advanced technology. And they most definitely have had bases on Earth for a very long time. I’ve always been intrigued by the fact that Adamski held a US Government Ordnance Department card, which gave him access to US military bases and other restricted areas. He liaised with many high-ranking military personnel, including Lord Mountbatten and Lord Dowding on one occasion, and even - in 1963 - with President Kennedy. Richard: I understand that you may have had what might be called a "contactee experience" yourself, what do you think happened? 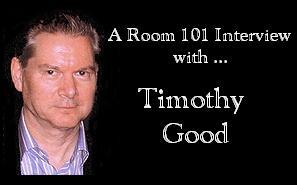 Timothy Good: Yes, in fact I've had several encounters with beings I believe were from elswhere. The first occurred at a diner near the Arizona/California border in November 1963 while I was on tour with the Royal Philharmonic Orchestra. It would take me too long to go into all the details, but it involved an unusual young woman who - in the presence of three of my colleagues - responded very positively, but non-verbally, to my telepathic question as to whether she was from elsewhere. Just after we left the diner in our convoy of three coaches, I was astonished to see a road sign for Desert Center - I'd no idea we were anywhere near there. Quite a coincidence! The second encounter took place in the lobby of a hotel in the middle of New York in February 1967, between a rehearsal and concert with the London Symphony Orchestra. About half-an-hour after I'd transmitted a telepathic request for definitive proof that some aliens were living among us, an immaculately suited man walked into the lobby then sat beside me. Following my telepathic request to indicate by means of a certain sign if he was the person I was looking for, he did so immediately. Neither of us spoke. It was a cathartic experience for me. Richard: One of your books is called Alien Base. What do you think of the possibility that Earth could have already been covertly colonised by extraterrestrials or, alternatively, that another intelligent species could have evolved here long before mankind? Timothy Good: I'm convinced that Earth was colonized by ETs millennia ago, and that we humans are a hybridized species. Apparently, hybridization started at the time of Homo erectus. There are many different species of extraterrestrials. The abductions in more recent times seem to involve the use of humans for hybridization purposes. But for whose benefit? In the 1990's I spent a lot of time investigating cases in Puerto Rico and it's clear to me that the animal mutilations and abductions are related to the abduction phenomenon. For example, I interviewed a family who encountered bug-eyed creatures that had developed some human characteristics - specifically wispy traces of hair on their heads. Are they trying to adapt to our planet, and if so, why? Richard: Over 20 years ago now, in Above Top Secret, you were the first researcher to make public the controversial MJ-12 documents. What are your current thoughts on the documents and MJ-12? Timothy Good: As I have stated repeatedly in my books subsequent to Above Top Secret, the MJ-12 papers are forgeries. The purpose, in my view, was to smoke out some of the real MJ-12 members or those who were knowledgeable about the organization. The ruse worked. Several former military and intelligence personnel - e.g. Dr Eric Walker, a British-born scientist - have confirmed that MJ-12 existed (see Need to Know). Richard: It is commonly believed in Ufology that the UFO cover-up began in early July 1947 after the famous Roswell Incident. So, when I read your latest book, Need to Know: UFOs, the Military and Intelligence, I was intrigued to learn of a possible 1933 UFO crash recovery in Milan, Italy. The possible existence of a top-secret group - Gabinetto RS/33 - allegedly set up after the supposed 1933 crash, to deal with "unknown aircraft" was also very interesting. How likely do you think it is that a UFO did crash and that an Italian MJ-12 like group was set up in 1933? Timothy Good: The UFO cover-up seems to have begun in 1933 with the top-secret RS/33 group. Other governments – that of Sweden in particular – also became concerned about intrusions of strange flying machines that year. Unfortunately we don't have an actual description of the type of unknown aircraft which came down in Italy. I think it possible that a UFO did crash, but I have no definitive information on that particular case. However, the RS/33 documents – which include descriptions of unexplained craft seen by pilots in 1936 - are evidently genuine. Richard: What do you think of a possible link between Gabinetto RS/33 and flying saucers allegedly built by the Nazis during WWII? Perhaps you might have some thoughts on the Nazi "Bell" device discussed in Nick Cook's The Hunt for Zero Point. Timothy Good: Roberto Pinotti, who co-authored a book with Alfredo Lissoni on the case, believes that the alleged retrieval led to some German "reverse engineering". I don't know if that’s true. And as I said, we don't have (or at least, I don’t have) an actual description of the craft involved. As for the "Nazi hypothesis", one of the world's leading aviation historians, Bill Gunston, who wrote the foreword to Need to Know, believes there is no serious evidence that the Germans actually produced any highly advanced flying discs, though he concedes that they were beginning to work on conventionally propelled craft with circular aerofoils. Re "the Bell", it definitely existed and a great deal of information can be found in both Nick Cook's book and Igor Witkowski's superb Truth About the Wunderwaffe , but there seems no evidence that its use was related to flying machines of any sort. As Witkowski concludes on the final page: "There is no evidence that the Germans mastered the production of 'flying saucers' with a revolutionary propulsion. One may on the other hand prove that they were attempting to use analogous bell-shaped objects as a weapon." Richard: One of my favourite cases is the Berwyn Mountain Incident or "Welsh Roswell." What do you think may have happened in the Berwyn Mountains in 1974? And what do you think of the possibility of an MJ-UK group? Timothy Good: I never investigated this case personally, so I keep an open mind. As to the possibility of a "MJ-UK", probably an equivalent team was set up, but I have no specifics. The top-secret "Flying Saucer Working Party" (1950-51) would qualify in many respects. Whatever the case, the UK is subservient to the US regarding these matters. Richard: What are your thoughts on the recent UFO activity in the UK, particularly the police helicopter sighting near RAF St Athan, a military base outside Cardiff? Interestingly, when I asked Nick Pope about the sightings he said: "Some sightings have clearly been caused by Chinese lanterns, but the MoD appear to be using this as an excuse not to investigate." Timothy Good: I've yet to see a detailed official report, so I can't comment. Chinese lanterns (or "UFO balloons") have been responsible for nearly all the UFO sightings reported this year - and to a lesser extent, last year. They are a damned nuisance - particularly for us researchers. Richard: Given that your latest book is called Need To Know, how much do you think US Presidents and British Prime Ministers are allowed to know about UFOs? Also how much do you think big corporations might know? Timothy Good: A number of US presidents have been briefed on aspects of the alien problem. They were told as much as they needed to know. However, Eisenhower and Kennedy, for example (and perhaps a few others) also had direct contact with extraterrestrials. The most knowledgeable president, in my opinion, is George H. Walker Bush. As for the present incumbent of the White House, a friend of mine asked him what he knew about the UFO situation. “Ask Cheney,” came the terse reply. I doubt that many British prime ministers have been told much. I think that Margaret Thatcher, thanks to her rapport with Reagan, learned a few things. As far as big corporations are concerned, I’m told that there is indeed a degree of corporate involvement. Richard: In Alien Contact you interviewed Bob Lazar about his alleged experiences at S-4, a supposed ultra top-secret facility near Area-51/Groom Lake where, according to Lazar, alien technology is being studied and reverse engineered. How much of Lazar's story do you think might be true? And do you still think reverse engineering could be going on at Area-51? Timothy Good: Lazar claimed to be a nuclear physicist. He isn't. However, he is a talented engineer and launches his own rockets and drives and maintains a jet-powered car (or used to). Definitely something odd seems to have happened to him, but I remain dubious about some of his claims. Perhaps he was exposed to S-4 (which does, or did, exist) in case he came up with some original ideas. Or it could have been an experiment to test public reaction, knowing that he would tell the media. I just don't know. It's important to bear in mind that Lazar was drugged on several occasions by the security personnel at S-4. I have no idea what’s going on there now. Richard: Ben Rich, the second director of the famous Lockheed's Skunk Works and sometimes called the "father of stealth," once made the incredible comment that: "We now have the technology to take ET home." In light of this, how successful do you think any reverse engineering efforts may have been? And what are your thoughts on the idea of a secret space program? Richard: One of the most interesting chapters in Alien Contact is called "Cosmic Journey." What was Cosmic Journey and what do you think about it now? Timothy Good: The 1989 Cosmic Journey Project, supported by the US government, NASA and Rockwell International, was a proposal for an international touring presentation of space-related materials, such as a mock-up of the space shuttle, and even 6,000 square feet of UFO-related material. I was invited to become the official consultant on UFO research. The main portion of the show, I learned, would be the future of space and the technical advances predicted over the next 100 years. To my everlasting regret, I was unable to make the private meeting with the organizers in Florida, and recommended former NASA engineer Bob Oechsler to fill the position. The rest is history (see Alien Liaison/Alien Contact). Suffice it to say that Bob learned a great deal and claimed to have had some extraordinary experiences while working on the project – which eventually was cancelled. Richard: What are your plans for the future? Are you working on anything or have any new cases grabbed your attention recently? Timothy Good: I’m always working on new cases. I have no plans for a new book, however - I’ve yet to sort all my files relating to the last one, which took several years of intensive work. There’s also the question of money. Unearthly Disclosure (2000), for example, cost me around £35,000 – flights, local transport (including hired planes), hotels, researchers, translators, on-site interpreters, a forensic specialist, and so on. As for (relatively) recent cases that have grabbed my attention, the mile-wide craft of unknown origin seen by multiple witnesses in January this year over Stephenville, Texas, impressed me, as did the radar-confirmed sighting by two airline pilots and passengers of two apparently mile-wide craft over the Channel Islands in April last year. Richard: Thanks again, I look forward to your future books, interviews and lectures. Published: Wednesday, June 17, 2009 at 10:11 a.m.
Last Modified: Wednesday, June 17, 2009 at 10:11 a.m.
De Void is on an e-mail list soliciting support for a ballot initiative in Denver called the Extraterrestrial Affairs Commission (EAC). If it gathers 4,000 signatures by the Aug. 4 deadline, city residents will be asked in November to approve the first municipal outreach program to ET in the United States. And frankly, this puts De Void in a bind. That’s a stretch, but a quibble next to its other provisions. If approved, the non-salaried, seven-person EAC panel would include an “expert” PhD in social sciences or psychology who has “consulted at least 100 people about their alleged close encounters.” Plus an MD/published author and an “expert” on UFOs. And a UFO/ET “expert” of unspecified pedigree who has written a book or published three related articles in “scholarly journals.” As well as – gulp – somebody with a “certificate or diploma” in any Exopolitics outfit registered as a 501(c)3. No doubt you’re asking yourself: Why must they be Exopolitics-certified? Why can’t they have an Ambassador to the Universe degree from Steven Greer’s Center for the Study of Extraterrestrial Intelligence for $995 (De Void 2/26/09)? Are there two schools of competing thought, like Milton Friedman v. John Maynard Keynes? Five-course tuition for an Exopolitics Certificate runs $1,875, a Galactic Diplomacy Certicate goes for $1,500, and $2,625 will get you an Exopolitics Diploma. The Web site offers “early bird specials” so if you pay early they’ll knock a couple of hundred bucks off the top. But even at full price you won’t find these sorts of bargains at your local junior college. Bottom line: these guys are talking about establishing a new priesthood. Just what the world needs – more intermediaries. You can see the whole list of required aptitudes at http://www.examiner.com/x-2024-Denver-UFO-Examiner~y2009m5d15-New-launch-for-Extraterrestrial-Affairs-Commission-initiative-in-Denver. Think it’s high drama to watch wisps of smoke streaming from the Sistine Chapel to end the backstage wrangling for a new Pope? Ever seen UFO “experts” jostling for attention? Blowtorch city, man. You’ll need asbestos goggles and cornea replacements for this one. Maybe that’s why De Void hovers over the keyboards, fingers unable to tap the delete key. What if Denver actually passed this thing. Somebody could make a mint raffling off front-row seats to cultural anthropologists studying the competition among UFO “experts” hoping to speak for planet Earth. It could provide a windfall in the arena of behavioral sciences. EXMOUTH man Roy Shaw has exclusively spoken about the moment he came face-to-face with what UFO experts are calling a Close Encounter of the Third Kind, writes Becca Gliddon. ROY Shaw does not believe in aliens, ghosts, flying saucers or anything he cannot physically touch or explain. But recently Mr Shaw, a retired engineer, saw something unusual in Phear Park that frightened him so much, it caused him to run home so fast he twisted his ankle in the process, writes Becca Gliddon. Mr Shaw described a white, translucent shape, similar to what he has drawn here. Mr Shaw believes he saw a UFO land in Phear Park and witnessed a 'white shape' come towards him. The Withycombe Raleigh resident calls the experience 'weird' and is at a loss to explain what he saw. An Exmouth UFO boffin believes Mr Shaw had a brush with alien life, and calls the 'rare' event a Close Encounter of the Third Kind. Mr Shaw is worried people will think he is a crank after reading his account of the strange occurrence. But he is keen to point out that, far from believing in little green men, he remains a sceptic and still cannot give an explanation of what he saw that night. Mr Shaw said: "The object was round in shape and about 30-feet in diameter and 100-foot long, with blue and red flashing lights on its perimeter, and it appeared to land at the top end of the park by the bowling green. "My dog started to growl when, what I can only describe as a white shape, came towards us. "It was about four-feet high and seemed to be translucent, and moved very slowly towards us. "I was transfixed because it made a droning noise which sounded like 'my my,' over and over again, which I could not understand. "I didn't know where the sound was coming from but it was coming straight towards me. "I immediately ran back down through the park." Mr Shaw said the UFO appeared to hover over the hedge of the bowling green, then flew horizontally from left to right, before immediately shooting off at high speed, back to the left at a 45-degree angle. He said the UFO appeared from nowhere. He did not see it fly overhead, or land. Mr Shaw said his normally-placid border collie dog, Sydney, ran away from the object after baring his teeth at the approaching figure. "I twisted my ankle when I ran like hell," said Mr Shaw. "My dog Syd kept whimpering and kept looking out of the bedroom window towards the park until at least two in the morning. "I had problems sleeping because I just kept going over in my mind what I had seen. "I still can't believe what I saw and I am still in a state of shock. "Syd doesn't like going back up there now. Something put him off. "Everybody thinks you are crank when you report something like this. "I am an engineer. I like to touch and feel things. If I can touch it, it exists, but there's no way I can explain this." Exmouth UFO expert Nigel Wright said: "This is a close encounter of the third kind. "The definition of a third kind is having encountered an occupant of a UFO in close proximity to the craft itself. "This is a really important sighting."